HP Umpire Tom Hallion ejected Tigers pitcher Matt Boyd (throwing at Phillies CF Odubel Herrera) in the bottom of the 5th, Phillies pitcher Parker Frazier and Manager Gabe Kapler (throwing at Tigers CF Derek Hill; QOCU) in the top of the 8th, and Phillies pitcher Pedro Beato and Bench Coach/Acting Manager Rob Thomson (throwing at Tigers RF Dylan Rosa) in the top of the 9th inning of the Tigers-Phillies game. In the 5th, with two out and none on, batter Herrera took a 3-1 fastball from Boyd for a hit-by-pitch. Replays indicate the pitch was located inside and struck Herrera on the right elbow, following a 0-1 pitch that sailed above Herrera's head, the call was irrecusable. At the time of Boyd's ejection, which resulted in automatically issued warnings, the Tigers were leading, 5-1. In the 8th, with one out and none on, Tigers batter Hill took a 1-2 slider from Frazier for a hit-by-pitch. Replays indicate the pitch was located inside and struck Hill on the back of the left thigh, the call was irrecusable. 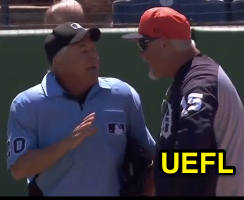 At the time of the Hill and Kapler ejections, the Tigers were leading, 5-2. In the 9th, with none out and one on (R1), Tigers batter Rosa took a 1-1 fastball from Beato for a hit-by-pitch. Replays indicate the pitch was located inside and struck Rosa on his left hip, the call was irrecusable. At the time of the Beato and Thomson ejections, the Tigers were leading, 5-2. The Tigers ultimately won the contest, 6-2. These are Tom Hallion (20)'s first, second, third, fourth, and fifth ejections of 2018 Spring Training. 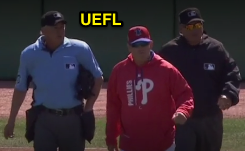 This is the first, second, third, fourth, and fifth ejections of 2018 MLB Spring Training. This is the first player ejection of the preseason. Prior to ejection, Boyd's line was 4.2 IP, ER. This is the second player ejection of the preseason. Prior to ejection, Frazier's line was 1.1 IP, 0 R.
This is the first Manager ejection of the preseason. This is the third player ejection of the preseason. Prior to ejection, Beato's line was 0.2 IP, 0 R.
This is Matthew Boyd's first ejection since April 22, 2017 (Jordan Baker; QOC = U [Throwing At]). This is Parker Frazier's first career MLB ejection. This is Gabe Kapler's first ejection since July 24, 2004 (Bruce Froemming; QOC = U [Fighting]). This is Pedro Beato's first career MLB ejection. This is Rob Thomson's first ejection since August 24, 2017 (Dana DeMuth; QOC = U [Throwing At]).